Looking for a friendly place to host your next meeting or community event? 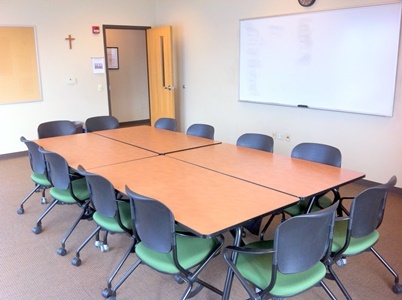 The Catholic Multicultural Center has space to meet your needs and welcomes you to use our facility. The CMC is happy to offer facility use to other non-profits, schools, churches, governmental units, and private businesses, especially for events that engage the community we serve. At this time we are unable to provide facility use for private parties and events, such as wedding receptions, birthday parties, quinceañeras, etc. The Center features six classrooms, a conference room, commercial kitchen, dining room, and a large community room available for rent to community organizations and groups. All rooms feature Wi-Fi internet access. Catering services are available upon request. All activities taking place at the Center must be consistent with the teachings of the Roman Catholic Church. For more information, rates, and rental procedures view the Facility Use Information document. For room details and photos, view the Room Information document. To reserve a room, please place an inquiry with Steve Maurice using the staff contact form and writing “Facility Use” in the subject line. See the Facility Use Information document (above) for what information needs to be provided in order to reserve a room.